We haven't talked about the three-year-old class of thoroughbreds since the Travers Stakes in late August, and the class is generally so underwhelming that I really wasn't expecting to talk about them again so soon. The Pennsylvania Derby came up surprisingly strong, though, and it's the most interesting race of this weekend. There is certainly room for a star to emerge from this class, and favored West Coast is perhaps the most likely horse to do so. He certainly doesn't get a walkover here, though, so if he wins he will have proven a little more about what he is. West Coast, Mike Smith, 8/5: This was a late-blooming colt - he didn't make his debut until Feb. 18. He was only second then, but he has found himself since. He broke his maiden in his second try, was second in the Lexington in his stakes debut, and then won four in a row, including two stakes races. The highlight, of course, was the Travers last time out. He beat a strong field featuring all three Triple Crown race winners, and he looked very good doing it. He's working great, the distance and the travel certainly aren't concerns, and he has the best combination of big-race rider and big-race trainer there is. He's going to be ready for this one - that last workout of his was blazing fast - and I don't see him getting beat. The price isn't going to be anything to write home about, and it means we aren't going to be able to go deep in the exotics, but West Coast is the clear pick. Irap, Mario Gutierrez, 3/1: Here's the list of things I like about this horse - his sire, Tiznow, was a legend. And that's pretty much it. He has three graded stakes wins this year, but that has everything to do with his connections being good at picking soft spots. 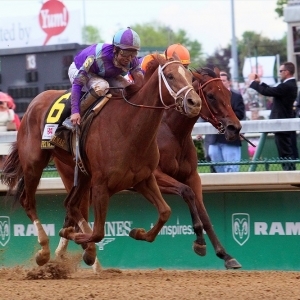 When he faces good competition - the Derby, the Travers - he just isn't good enough. And that's no coincidence. He's not nearly talented enough to be at the top of this class. Irish War Cry, Feargal Lynch, 9/2: This horse owes me all kinds of money. I really liked him in the Kentucky Derby. He finished 10th. I trusted him again in the Belmont, but he came up short, finishing second behind Tapwrit. The Haskell felt like a really good spot for him. It wasn't - he was a flat fourth. The talent and breeding are great, but I don't love the jockey here, and I don't like the race shape - he likes to be near the lead, and there is plenty of speed here. I've been burned too many times and will be passing on him here. Timeline, Javier Castellano, 5/1: He had won his first four races, so expectations were high entering the Haskell. He was the favorite in that race, but he fell flat, finishing fifth. He hasn't raced since that race at the end of July, but he's working well lately and could move on from that last performance. He's a horse that likes to lead, and again he's going to have some company up front. West Coast is also a front runner, and he's more proven and more talented, so that's a problem for this horse. West Coast is also a more versatile horse - he can run off the lead, but this horse doesn't like to. The price could help this horse's case - especially if the public grabs onto West Coast and Irish War Cry - but he's far from the most likely winner. Outplay, John Velazquez, 12/1: I'm not going to question Todd Pletcher as a trainer - he's as good as it gets. But I am not crazy about how this horse has been managed. He won impressively in the Curlin Stakes at Saratoga at the end of July. Yet, instead of bumping him up to graded stakes company somewhere in August, he has trained all the way up to this race. He's worked well, but I would still rather have seen him back on the track sooner. He has some clear talent, and sire Bernardini is a real favorite, but he's yet another horse who likes being closer to the front, and that makes it a tough spot for him here. He could be useful as a long shot, but he's in tough.